The fascination with Chicago's infamous gangsters continues today despite the height of the gangster culture having taken place long before World War II. Here are some ways you can take a self-led or group Chicago gangster tour and immerse yourself in the world of the likes of Al Capone and John Dillinger. The Biograph Theater on Lincoln Avenue on Chicago's North Side is the infamous site where, in 1934, FBI agents lay in wait for gangster and bank robber, John Dillinger. Dillinger was gunned down as he was exiting from a movie—an on-the-nose gangster movie— because he drew a gun on the agents. Now home to the Victory Gardens Theater, the exterior of the Biograph was temporarily restored to its former glory for the filming of the Johnny Depp biopic Public Enemies. Address: 2433 N. Lincoln Ave. Address: 1400 S. Wolf Rd., Hillside, Ill.
Office Hours: Monday through Friday, 8:30 a.m.-4 p.m.; Saturday, 9 a.m.-1 p.m.
Tommy Gun's Garage is a unique interactive dinner theater set in the Prohibition-era. The entire space is decorated as a 1920s "speakeasy" and features a sit-down dinner as well as a musical show with "gangsters" and "flappers", performing tunes from composers of the era like George Gershwin and Cole Porter. The cheese factor is high, but if you can let your inhibitions down a bit, it makes for a fun time. 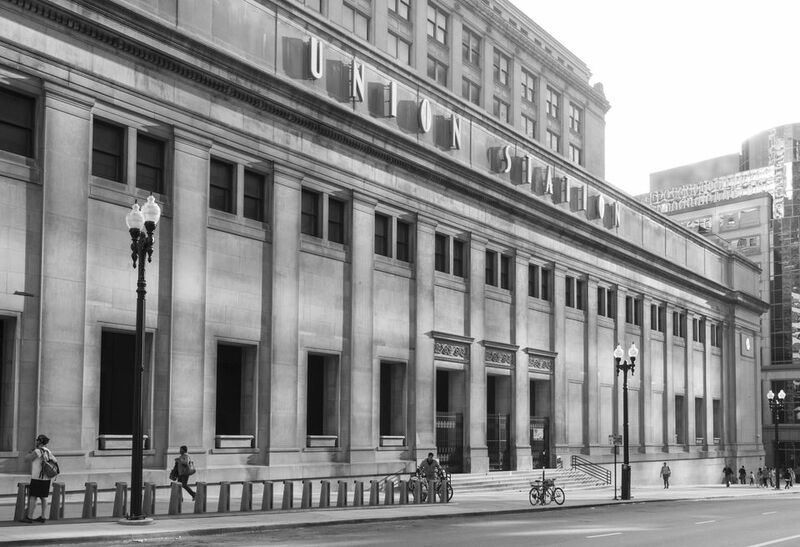 Address: 2114 S. Wabash Ave.
Union Station, a hub for the Metra and Amtrak rail lines, is known for the famous shootout scene in the movie The Untouchables. And while the incident was entirely made up by Hollywood—especially the "baby carriage" nod to The Battleship Potemkin—Chicago gangster fact and fiction are so blurred at this point it's made it a stopping point on a tour of "gangster history." On Feb. 14, 1929, seven gangsters were shot and killed at a garage in Chicago's Lincoln Park neighborhood in what became known as the "St. Valentine's Day Massacre." While it was never proven, it's commonly believed that the men were murdered by members of Al Capone's gang, or hit men hired by Capone. The killers tricked the gangsters into letting them in by dressing as police officers. The main intended target, "Bugs" Moran, escaped injury when the "go ahead" signal was mistakenly given early and Moran had not arrived at the garage yet. Unfortunately, a visit to the site is just to have an "I was there" moment, as the original building is long gone. Address: 2122 N. Clark St. If a guided tour is more your thing, then consider Untouchable Tours, which bills itself as "Chicago's Original Gangster Tour." You'll go on a two-hour driving tour in a jet black school bus and be shown many of the gangster landmarks and hangouts. The tour guides wear period costumes and get into the gangster role. Expect to hear a lot of "dees, dems and does," as in "dees guys, dem dolls and does times." Address: Tours leave from 600 N. Clark St.